The Amish are known for their low-tech rural lifestyle. They farm without tractors, keep in touch without telephones, and craft furniture with hand tools rather than factory-scale machines. Why do the Amish reject modern technology? The brief answer is that the Amish base their lifestyle on rules that were developed in the 1500s, re-affirmed around 1700, and adjusted only slightly in recent centuries. The roots of modern Amish practices grow from a fascinating seed that combines history and religion. Early in the 16th century, several groups of European Christians broke away from the Catholic Church. The “Anabaptists”, or “re-baptizers”, eventually became known as “Mennonites” in honour of one leader, Menno Simons. The Mennonites established written rules, known in German as “ordnung”, to guide both daily life and religious practices. They would not have seen much difference between ordinary and religious duty. Instead, their whole lives were dedicated to living in harmony with God and each other. Some other Christian denominations were more co-operative with their state governments. Mennonites, however, were often persecuted: imprisoned, banished or executed. Those who remained true to the Anabaptist beliefs therefore took their faith very seriously. Mennonites found themselves better able to survive in rural farming villages than in towns and cities, where their differences would be more noticeable. In turn, this helped the believers depend on their own community for support in times of crisis, and to maintain their beliefs and practices. One early Mennonite form of discipline was “meidung”, or “shunning”. A person who failed to follow the ordnung could be shunned by family and friends. Beyond social isolation, this also kept the person from economic participation in the community. When that person repented, he would be restored to full fellowship. By the 1690s, Jakob Amman became a leader in one Mennonite community. He was both a strict traditionalist for the ordnung and meidung, and also an innovator in some of their worship practices. When he recommended that one woman in particular be shunned for telling a lie, some other leaders disagreed. Further disputes about doctrine and practice led to Amman pronouncing a “shunning” on the dissident leaders. The disputes continued from 1693 through 1698. Eventually a new Anabaptist group emerged that held more strictly to enforcing the existing ordnung by means of the meidung. The stricter group became identified with Jakob Amman as the Amish. Various Anabaptist groups, including the Amish, left Europe due to religious persecution or to find better farmland. 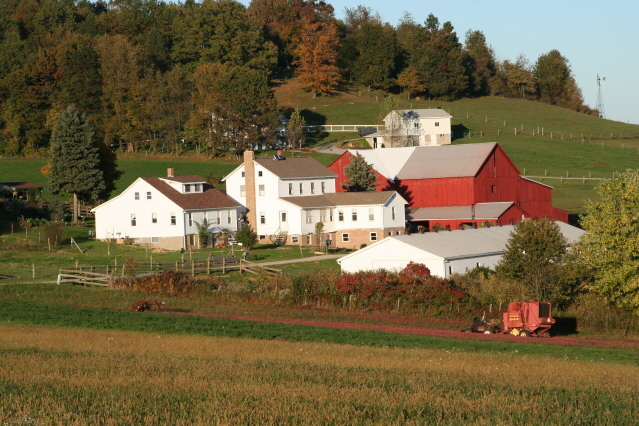 The Amish first began immigrating to Pennsylvania in the early to middle 1700s. While “conditions in Europe were almost intolerable”, sailing to America was a risky venture simply from the standpoint of health while on board ship. Amish communities were established in North America once a few families settled on neighbouring farms. The first Amish settlers came to Ohio from Pennsylvania in 1808. These states continue to represent some of the largest Amish populations in North America. 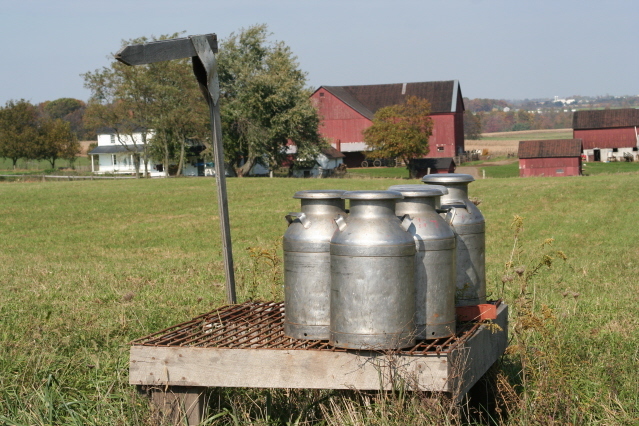 In the 17th century, the Amish used the technology available at that time. One reason that the Amish do not readily embrace new technology is that the old methods are included in the ordnung; therefore any changes require discussion and discernment. Remember, this is a society where a clothing style can remain in fashion for a century or more. It takes some time to decide whether replacing a horse with a tractor is permitted or desirable. Another reason is an interpretation of II Corinthians 6:14, which says “Be ye not unequally yoked with unbelievers…” in the King James Version of the Bible. This is taken to mean that electric power lines or telephone lines would “yoke”, or join together, an Amish home with their less holy neighbours. How do the Amish light their homes? Oil lamps, camping lanterns or battery-operated lights are three methods. Some Amish use diesel generators or solar panels to charge cell phones, while still avoiding land-line telephone services or electricity from the local power company. The key concern is not so much the use of electricity, but rather having a permanent connection with “the world”. 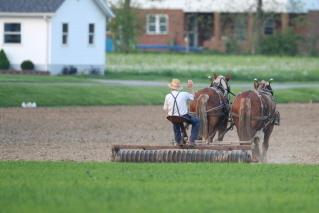 On the farm, the Amish use draft horses to pull plows and carts, as well as seeding and harvesting equipment. Some Amish use an “Amish tractor”, consisting of a standard tractor engine on a horse-drawn cart, to power their field equipment. One concern is that self-propelled tractors have some capabilities in common with pick-up trucks. Using one for farming may lead to using the other; and then it’s a slippery slope to automobiles and other “worldly” possessions. Personal automobiles travel faster than horse-drawn wagons. That would make it too easy to roam too far from home, whether for work or to make friends from outside the Amish community. Avoiding modern electronic entertainment, such as television and radio, ensures that families and friends spend time in fellowship with each other. If you sometimes wish that your life were simpler and less complicated with a “slower” pace: the Amish continue to achieve your dream. How Can the Amish Manufacture Fine Furniture using Limited Technology? A typical Amish furniture manufacturer is a very small firm, typically with no more than half a dozen employees. Their emphasis is on hand crafting their products using local materials. The Amish have earned the right to have phrases such as “quality workmanship” and “solid wood construction” associated with their work. Amish furniture manufacturers are more likely to fulfill orders from their retailers, rather than to schedule lengthy production runs of one model before re-tooling for the next product. 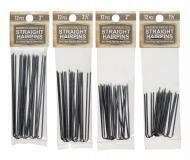 This, of course, contrasts with much of the 20th-century wisdom in manufacturing that large batch sizes are more economical. The focus on hand crafting also allows an Amish furniture manufacturer to insist on high quality lumber and other materials. There is no incentive to cut costs on materials or labor, because most of their products are sold regionally rather than globally. Amish manufacturers cannot risk alienating local retailers with shoddy goods; they cannot simply expand their marketing efforts to export bulk orders overseas. Since electric power is limited to the company’s diesel generator, the workers mainly use smaller machines such as lathes or routers. Of course, hand tools are also used when feasible. Thus, the furniture is hand-made, rather than the result of computer-controlled automation. 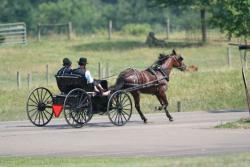 The Amish place high importance on maintaining interpersonal relationships through dependability. Each worker appreciates the need to work carefully and diligently to produce quality furniture so as to meet the expectations of the retailers and their customers. Of course, you can gain more insight into the way people feel about their lifestyle by actually speaking with them.